I have been working on orders two more banners. Both with a 'girly pink' theme. I hope the girls like their banners. My latest batch of 'Inchies'. 16 in total with a blue green theme. 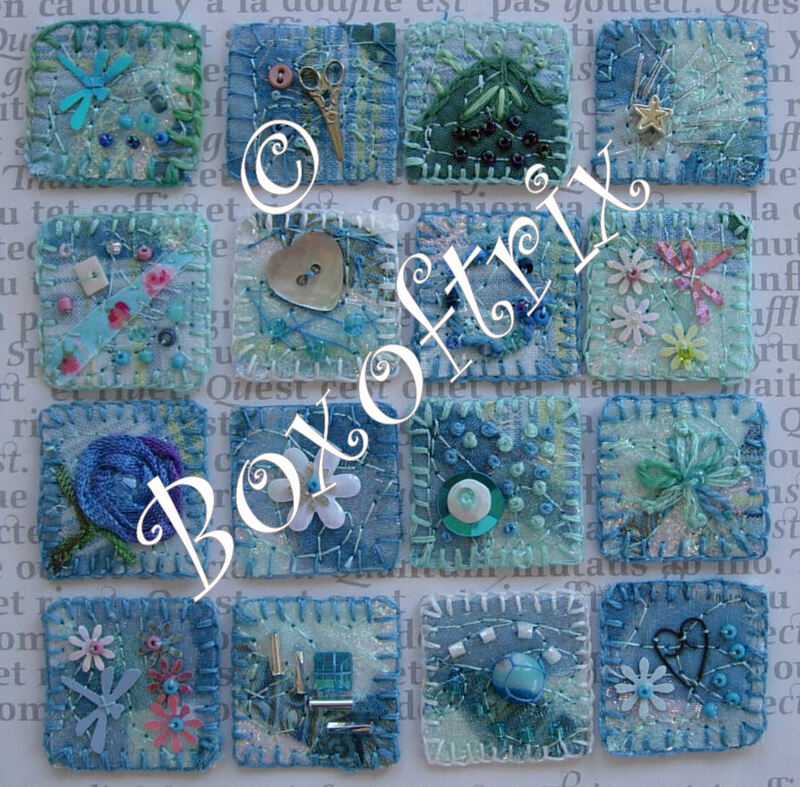 12 of these have gone to Dot with whom I'm delighted to be doing a swap with. 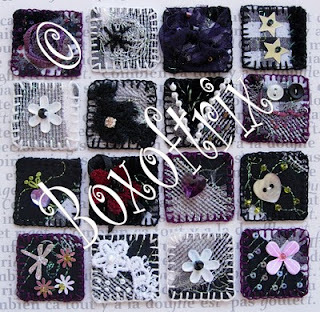 Her blog is filled with much to inspire anyone who enjoys, creativity especially with fabrics and embellishments. As usual with all the inchies I make, they are done in batches of 16. 12 to send & 4 to keep! I began working on the design for this 'Daisy Doodle' necklace around June 2007. Due to ill health the piece was put aside in a bag and almost forgotten until I came across the some sketches and sample pieces for it. It was intended for an exhibition I was taking part in with our embroiders guild group. I found it again and finished working on it just in time to include it in the exhibition. I'm really pleased with how it turned out, much how I had imagined it to look. The Daisies were fun to make and I'm working on some new designs using the same technique. This is 'Sparkle' I mailed her off yesterday to her new home in the Netherlands. I had thought about making a star shaped art doll and the opportunity to join a swap for one came along on swap bot so I joined in. The swap was called star Dotee, although I don't think she is a Dotee. To me Dotees are Dotee shaped and I would think that this is more of an art doll. She was fun to make and although quite plane, she is very sparkly with iridescent sequins and beads sewn all over her and a diamante on her tail. Two Pink themed fabric ATCs for a Swap-bot swap. Hand dyed jersey cotton with organza overlay, machine couched yarn & hand embroidered centre embellished with seed beads & pink bugle beads to finish. Edge is hand stitched in space dyed 'Oliver twist' machine cotton. Pink space dyed cotton, machine stitched & embellished with hand painted fabric daisies and seed beads. Edge is hand stitched in space dyed 'Oliver Twist' machine cotton. 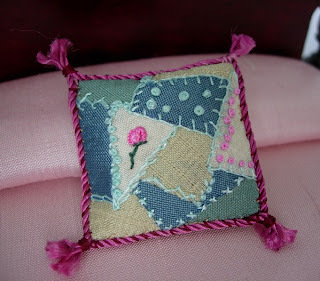 This morning I checked my email and discovered that, as I slept, my little miniature embroidered crazy silk cushion had sold to a buyer in the US. This is a lovely little cushion, one of the first I stitched and I had mixed feelings as I placed it in the box to post to its new owner in USA. Most of my miniature pieces are put up for auction or sale as soon as they are finished, if I don't, I get a little attached as they begin to look more and more at home in my own collection. However I make these miniatures with the view in mind that they will be part of, and belong in other collections. There is something very satisfying about that for me too. The sale also reminded also that I had not yet blogged about my recent trip to Arbroath and the wonderful group of ladies who invited me to do a 'workshop with them on the 'Crazy Patchwork Cushion' on Sunday 11th May. 'The Angus Puffins' as they are collectively known, made me feel very welcome and we had a very busy day cutting our, piecing and stitching. I must say that only 3 of the ladies were accomplished needle workers the other ladies some had stitched before and some hadn't so on the whole it was a very tricky & in their own words 'challenging' workshop. I had not taught this particular workshop before and so it was a learning curve for me also. I think we all had a lovely day, the buffet lunch was delicious which was provided by all, consisted of two delicious home made quiche and a selection of mixed salads. Dessert was absolutely out of this word creamy raspberry cheesecake which was about 3 inches thick (probably added the same to my waistline) and a lovely bowl of fruit salad with lots of berries which gave it a lovely crimson colour and taste devine.I learned a lot from teaching the workshop I learned that not everything that I take for granted is easy for other people to do & that they might want to go about it in a different way. I also learned that it is better to buy packets of Bondaweb rather than 'off the roll' as it separates and causes all sort of problems. ...... if any of the ladies are reading this, I thought about the problem all the way home and I now know there is a better way to get around it and not loose tiny sections of almost invisible Bondaweb when the backing doesn't want to stay put! I also learned that there are so many different colour combinations possible with these little cushions, no two ladies had the same set of colours or indeed matched with the same threads and it was lovely to see the variation and how it can be used to design a cushion for any time period in the miniature world. 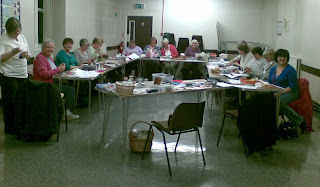 Well done to ladies who had never sewn before I was very impressed with their results! Although none were completed by the time I left, the ladies have assured me that they will all complete their cushion projects and send me some pictures so I look forward to that.The other reason for this post is to say that after all the writing of the tutorial for the Dolls House & Miniature scene magazine (issue # 160 ~ still available on back issue) and doing the workshop I have been working on & hope to make this available as my 5th kit & 1st embroidery kit very soon. 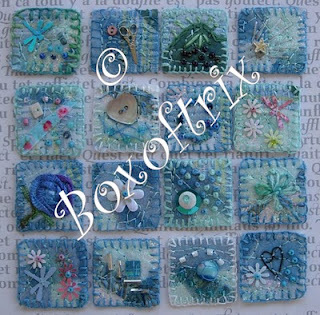 These little inchies are great fun to work on and great for getting creative inspiration for other work. I have been tempted to do some for a while but it took signing up for a swap before I actually got around to doing some. With this swap I have 2 partners each gets 12 inchies. So I made 16 of each colour theme and below are the 8 inchies I have decided to keep for myself. I figured I would soon build up a nice personal collection which I will probably frame. It will be nice to build up a collection in a variety of colours. In return for the ones I send I will hopefully receive 2 sets of 12 back, and hopefully again these will be in my colour preferences so if I build up a collection of these they should also make a nice collection to frame. So I have been thinking and wondered if anyone would like to swap 12 inchies with me, I would prefer fabric inchies, embroidered & embellished in your style. So if you are interested please leave a comment or email me privately. At the EG Scottish Regional Day in Edinburgh I bought some goodies from the fantastic assortment of stalls, I love ‘The Silk Route’ for its collection of theme packs & I bought 2 of these ‘Titania’ & ‘Teal’. ‘Oliver Twist’ is just wonderful for all kinds of dyed threads and hanks of yarn I wanted to buy everything as it has been so long since I have had the pleasure of browsing their selection of goodies, I stopped going to the Creative Stitches Show in Glasgow a few years ago when they stopped holding a stall there. I opted for 3 reels of cotton in variegated blues and greens & 2 bags of ‘Short Lengths’ dyed, yarns in greens & teals. Next a bag of ‘Crafty Notions’ mid green merino tops, caught my eye on the ‘Grassmarket Embroidery Shop’ stall, such a beautiful shade too I’m looking forward to incorporating it into a needle felted piece. ‘The little bead shop’ had a wonderful selection of seed bead tubes I bought 2 tubes; one of turquoise blue one in a bright sunny yellow. The Embroiderers Guild Edinburgh branch had a stall selling a selection of theme packs and books they also had reels of thread, some vintage some slightly used and a selection of fabric in bundle wraps and single pieces, I opted for three different pieces of fabric in the end and went for colours I don’t normally choose to work with, Yellow /gold shot organza, red/purple shot lame and a beige cotton with red flowers…all at a very reasonable 50p each! Some of these goodies came in handy for my latest project….. This year we are going on a camping holiday, in the past when we had our caravan there was always room to store a basket of art materials to take and enjoy some creativity in the van. This year space is more precious and everything must fit in the car! I have been looking at the different things which are available for storing artist materials & in particular pencils & sketchbooks. There are some wonderful handmade items available on Etsy such as Pencil rolls and sketchbook covers with slots for pencils etc. So I opted to design instead a fabric Pencil Pot, which would protect, store and allow me to use the pencils easily. I figured I would need a thick supporting fabric so I opted to use some denim form an old pair of jeans with a layer of thick artist canvas on the inside and base. The top gathering fabric is a double layer of blue and green shot poly/cotton mix I love this fabric and have used in so many different projects & for the pocket; some thick curtain fabric from a sample book in a nice mid blue. 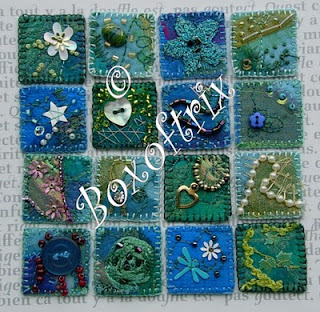 For decoration....I choose the ‘Oliver Twist’ Machine Cottons & the pretty little turquoise blue seed beads. I’m quite pleased with my little pencil pot looking & forward to using it on holiday! I did a swap with Shannon who makes the most beautiful wire and bead butterflies and dragonflies. I now have four of her beautiful creations in the windows of my studio and my daughter April also has one in her room. This next one is for our sweet little niece called Penny who has special needs. She is having a whole new bedroom designed and built just for her and the equipment needed to care for her also it help her mum as she wont have to carry her upstairs. I hope she likes her banner and that it will be a nice addition to her new surroundings. Having wanted to make a triangle banner for a little while now I decided that it was time. Made from a pair of jeans & t~shirt she has outgrown and some other pink and white pieces from my fabric & trimmings stash. I used some old iron on transfers in the letters of her name and free machine embroidered over them. I used a fine black ribbon to string it all together as her room is black and pink. April loves it and has it hanging in her room now. 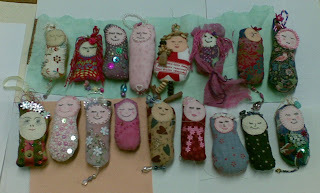 At our monthly Embroiderers Guild meeting we had a little workshop making Dotee Dolls. We had such a fun time and most ladies had their dolls almost complete by the end of the evening meeting. I'm sure you will agree that they all look fab!